ENERGY DEMANDS in the race horse are extremely high, so the delivery of additional calories becomes paramount. This additional digestible energy must be provided in a manner that maximizes performance while helping to maintain digestive tract health and function. 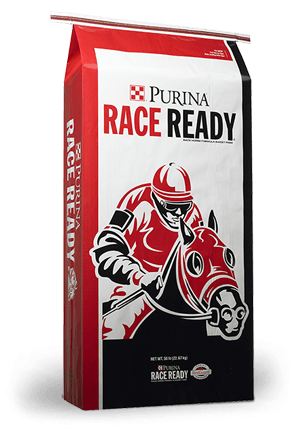 Purina® Race Ready® Horse Feed is designed to deliver a large amount of energy to these hard-working athletes, while addressing digestive tract concerns by distributing the calories over several sources (vegetable oils, digestible fiber such as beet pulp, high quality natural grains and molasses). Research has shown that the utilization of vegetable oils and highly fermentable fibers, such as beet pulp, can be of benefit to the hardworking equine athlete.